Big things are happening in a small town just north of Pittsburgh, Pennsylvania. Tucked away in the foothills of northwestern PA, a strength equipment manufacturer is making big waves in the fitness industry. PRIME Fitness burst on to the strength equipment scene in 2014 with their “science-forward” approach to commercial strength equipment. With innovative technology, next-level biomechanics, and USA craftsmanship quality, it wasn’t long before the most elite training facilities were choosing PRIME equipment. In 2017, the company took the same approach, rooted in science, to the accessory market, and have been making heads turn since. “Since the beginning, we’ve always wanted to apply the same philosophy that goes into the creation of our strength machines to the accessory market,” said PRIME Sales Director, Mike Kearney. “We wanted to create an accessory that would demonstrate what is possible with a real scientific approach to product development,” Kearney continued. This year, their vision has been recognized by one of the largest publications in the fitness industry – Men’s Health. 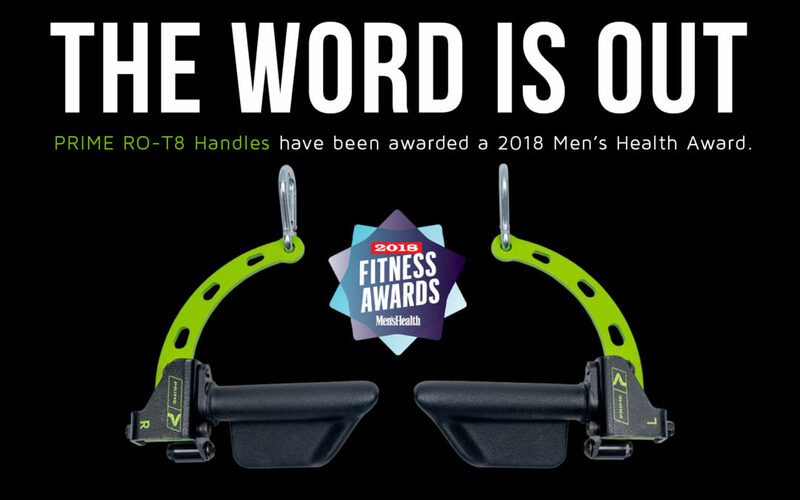 The PRIME RO-T8 Handles received the prestigious 2018 Men’s Heath Fitness Award, sharing the stage with brands such as Nike, Under Armor, and Garmin. “It’s truly humbling to accept this award from Men’s Health,” said PRIME President, Rod Griffin. “This award represents the continued shift to a more science-based approach to training, and we are honored to be a part of it. This only deepens our commitment to the innovation and development of world-class strength training equipment,” said Griffin. The RO-T8 (or ‘rotate’) Handles feature a rotational, ergonomic “paddle grip” that is designed to provide more surface area, drastically reducing joint pressure and grip fatigue. The enhanced biomechanics of the RO-T8 Handles allow for optimal exercise efficiency and maximum output potential to the targeted muscle(s). But the RO-T8 Handles are just one member of the PRIME RO-T8 Family of products. Since launching the RO-T8 Handles, PRIME has continued to innovate, expanding their portfolio to 7 RO-T8 products. Most recently, in May of this year, PRIME added the RO-T8 Spreader Bar to the Family, taking adjustability to new heights. The Spreader Bar features a 360° ROM, via a unilateral ball joint design, offering an ultra-smooth feel in any direction. To learn more about PRIME Fitness and their strength innovations, visit www.PRIMEfitnessUSA.com or e-mail them at info@PRIMEfitnessUSA.com.